The Kenya national parks are the places where the safaris take place - and Kenya has some of the finest safari parks in the whole world. 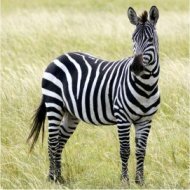 A safari is an integral part of the Kenya experience that you don't want to miss! This page helps you pick the right park for your trip. Which Kenya wildlife park have YOU visited? However, choosing one of the many Kenya national parks and reserves isn't easy, as they are widely regarded as being among Africa’s best, with stunning beautiful scenery and an amazing diversity of wild animals. The difference between National Parks and Reserves, by the way, is that the former are managed by the national Kenya Wildlife Service (KWS) while the latter are managed by local councils and tribes. But unless stated otherwise, everything on this page refers to both of them. There are considerable difference between the individual Kenya national parks and reserves. If you have little time, then Nairobi National Park is a good option. Within 30 minutes from Nairobi city centre, you’ll be in the middle of Kenya’s wild nature with a surprising variety of wildlife. The advantage is that it is home to four of the big five, and an important refuge for the endangered black rhino. It also has quite an abundant birdlife. According to many, Masai Mara National Reserve is the most spectacular and you’ll have a big chance there to encounter all of the ‘Big Five’ animals (rhinos, elephants, lions, leopards and buffaloes). Lions, which are probably the hardest of these to spot, are almost common in Masai Mara and the famous Wildebeest Migration takes place here every year. But, together with Amboseli National Park it also draws literally herds of tourists, also because they are relatively close to Nairobi. Especially in the high season (January-February) small traffic jams of white Nissan minibuses gather around each group of lions… Saiwa Swamp National Park draws little to no tourists, but it’s small and only accessible by foot. Aberdare and Mount Elgon national parks also draw few tourists, despite magnificent landscapes and good opportunities for wildlife viewing. If you are into elephants, then you want to go to Amboseli or Tsavo East. 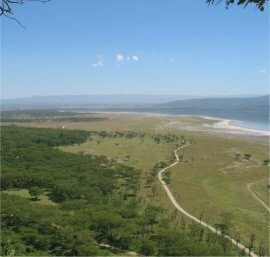 Lake Nakuru National Park is known for it’s enormous herds of pink flamingos and waterbucks. Take into account that nice scenery (forests, rugged terrain) often means less animal spotting, as they hide in the bush. This is the case, for example, in Aberdare and Meru National Park. Parks with many open planes, such as Tsavo East or Masai Mara, give the best opportunities for wildlife viewing though the landscape can become boring after days of game driving. Aberdare and Mount Elgon National Park , home of the country's second biggest mountain. The area around the country’s biggest mountain, Mount Kenya has a park named after it too and some peaks of Mount Kenya can also be reached by regular hikers without technical climbing skills. Bird watching can be done best in Samburu, Lake Nakuru or Mount Elgon National Park. Some Kenya national parks also have their own airstrips, suitable for small airplanes. If you can afford a plane ticket, you can skip the long drives between the parks among Kenya’s often terrible roads. Many visitors combine two or even more parks in a safari. But take into consideration the distance between the Kenya national parks, and the slowness of driving in Kenya due to often terrible roads. You don’t want to spend the bulk of your safari in a van zig-zagging between the holes in the roads for hours on end. Take into consideration that game drives are only conducted in the early morning and the late afternoon, as animals are active then. The middle part of the day is often spent at your lodge or campsite. Each of the Kenya national parks has it’s own best time to go, while many parks can be visited throughout the year. See my facts page about the major national parks and reserves for more information. Generally, the flora and thus the scenery is most vibrant and exotic during the rainy seasons, but animals are harder to spot as they hide in the bush. During the dry season vegetation is lower and the animals come out looking for water sources, so the guides know where to find them. During the rainy seasons it’s harder to get around in the parks because of mud, and cars break down quicker. Anyway you need a 4WD during the rainy seasons as all roads in the parks are unpaved. Most Kenya national parks are not fenced. But it is prohibited to enter without paying a fee at the official entrances. Respectable safari companies will do so while some of the budget companies may try to get you into the park using illegal routes. Don’t accept that. Entries to national parks are controlled by KWS (Kenya Wildlife Service) and admission to parks follows a ‘Safaricard’ system. You will encounter two types of safari cards, Temporary and Permanent cards. Permanent Safari cards are sold at a handful of park entrances, you can be charged with credit in advance and you can top it up at certain locations, mainly at park's main entrances. In case of remaining cash it is non-refundable. A temporary card on the other hand, covers your duration of stay which you surrender upon leaving the park. The system is currently in use at the Nairobi National Park, Aberdare National Park, Amboseli National Park and Tsavo National Parks, Mombasa and Malindi Marine Parks. Other parks work on cash only basis. You should note in such a case you turn up at any park gate with enough cash, you will be fine. Fees are paid by the 24 hours in US dollars, UK pounds or KSH (Kenya shillings). A growing number of parks only allow payment with smartcards, which first have to be charged at specific Points of Interest (POIs). A smartcard can be used for any park or reserve, but unused credit is non-refundable. The entry fees differ from park to park but adult non-Kenyans usually pay up between 15 and 30 dollars per 24 hours, with discounts for children. Besides, vehicles are charged between 200 and 1000 KSH ($3 to $15) extra, depending on their size. If you aren’t on an organized tour, you can also hire a guide at the entrances. Most visitors will get in with an organized tour (typically starting at 4 people), but it is also allowed to take your own vehicle into the park. Many Kenya national parks are well geared to tourists – with tracks, shops and luxury lodges - but none of them run any bus service into the parks for people without their own transport. So if you don’t have your own transport you’ll have to go with an organized trip, or try to associate yourself with a group at the gate (no guarantee of success here!). It‘s possible to organize a do-it-yourself safari though for most people that’s not advisable - all in all, it will often cost more than just hiring a company. Human habitation – apart from the tourist lodges and campsites – is fully prohibited in the national parks, while the national reserves (administered by the local councils) somewhat less strict on this issue. All Kenya national parks and reserves are protected by law. It’s prohibited to leave the roads (although that’s a big word for the unpaved tracks which they usually are). You’ll heavily damage fragile ecosystems and disturb animals if you do. The speed limit within the parks is advertised at the entries and is usually 30 kilometres per hour. Actually, it’s often impossible to drive any faster on the unpaved roads anyway... Driving at night (usually 7 PM to 6 AM) is prohibited within the parks. It’s not safe to leave your vehicle, except for those areas where walking safaris are possible. Wild animals are untamed and may easily kill humans if you interfere with them. It’s not only the lions and leopards that are dangerous, actually hippos and elephants kill more humans than lions. Smoking in the Kenya national parks and reserves is allowed. But please be careful as carelessly discarded cigarettes start numerous bush fires every year. Picking wild flowers is strictly prohibited, as well as harassment of animals, which disturbs their feeding, breeding and reproductive life. Gathering of woodfire for camping is usually prohibited, though a number of campsites allow small open fires if you behave responsibly. What's Your Story or Question About Kenya's National Parks? Have you visited one of Kena's national parks?Visitors who are prerating their trip to Kenya, will love to read about your experiences. Or do you have question? Just type it all below. Your story will appear on a Web page exactly the way you enter it here. You can wrap a word in square brackets to make it appear bold. For example [my story] would show as my story when it is published.